When I started KCWC my kids were much smaller and their clothes did only take an hour to make. Now it’s pockets and more pockets and buttonhole elastic and nice, sturdy seam finishes (i.e. lots more time for one stupid pair of pants). I made some baby clothes for a new(ish) baby and wow! you can just crank those teeny things out! The pants came from the sleeves of a felted cashmere sweater and they came together so quickly I did a bias bound seam finish along the crotch seam, because I felt like they couldn’t be done already. I still had more of the hour left, so I made a hat to match. The pattern is from Martha Stewart. Originally, the hat is made from felt and the seams are zigzagged together so they lie flat. I made two hats with normal seams and then sewed them together: cashmere on one side, jersey on the other. I’ve made this hat many, many times. I like how the orange tag on this one make the hat look like a skate punk blue bird. I finished both things in about 45 minutes, so I thought what they hell, I’ll make a ball with the scraps. Well, the ball took longer than both. 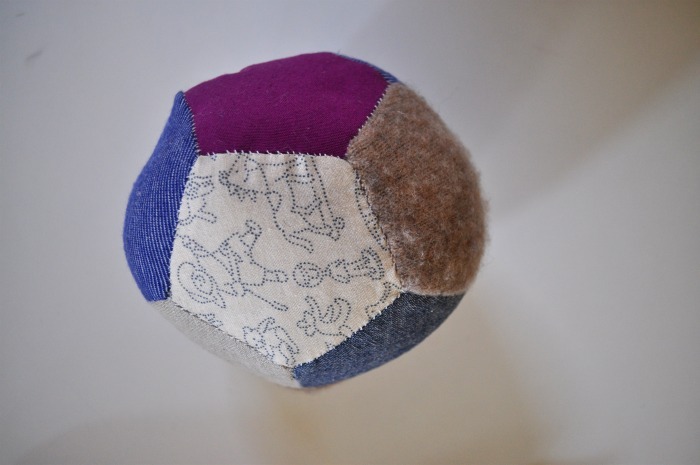 The pattern is for a paper pieced, hand stitched pentagon ball. Hand stitching isn’t really my favorite thing, but when you do it with your best friends on a beautiful fall day and a hot cup of coffee it’s not all that bad. The flickr group is really starting to fill up. One day and you guys are already on a roll! I already mentioned this on twitter, but one of my sponsors, Too Sweets, is offering my readers a 15% discount on her patterns (they are in pdf form, so you could use them today!) just enter KCWC15 when you check out. And while you are at it, check out my other lovely sponsors–many of whom sell very stylish children’s clothes patterns. Posted October 11th, 2011 in kcwc fall 2011, kids clothes week challenge, sewing clothes. Tagged: baby, ball, cashmere, fall, felted, fulled, hat, kcwc, pants, patchwork, sweater, upcycle. I fell in love with this little sleeper when I first saw it: it’s like those nightgowns for newborns, except stylish. At 40 bucks, it was a little out of my price range, but looked simple enough to recreate. Well, mine doesn’t quite live up to the original, but I think I got close. The pattern came from the book Growing Up Sew Liberated (which I reviewed here). The more I use this book the better it gets. A rare thing among craft books! Normally they are all eye candy, but look a little deeper and it turns out they are mostly errata and confusing directions. To alter the pattern I just extended the bottom bit, so it looked like it would tie up nicely. The edge really needs a rolled finish, but I’m not that handy with the serger so I left it raw. I might make this again and try to get the knot bit right. Posted August 17th, 2011 in sewing clothes. Tagged: baby, gift, handmade, knit, knot, nightgown, sewing, sleeper, stripes. oh you didn’t think it was over did you? The baby doesn’t really need clothes, but how can I not sew something cute for him. Plus it’s easier to make new pants than to go get the box of bigger clothes and go through it again. The knee pad pants are from the illustrious Dana of dana made it. And the purple pants I made from sleeve of a sweatshirt. He had some purple leggings that I was squeezing his chubby legs in because they were too cute to give up. Finally I traced them and made these and there are some yellow ones in the works from the same pattern. I bet you could squeeze in a couple hours of sewing this weekend to finish up some projects, then maybe take some pictures and put them up on flickr. Next week I’m going to show off some of the beautiful things that people have been making because wow! you guy are amazing! Posted May 15th, 2010 in kcwc spring 2010, kids clothes week challenge. Tagged: baby, boy, clothes, knee pads, knits, pants, purple, sewing, stripes, upcycled. This year I am determined to cut into the ridiculous amount of fabric I have amassed in my basement. It’s not there just to look at, right? It’s there so I can make the clothes and quilts and toys that my family needs instead of buying all that crap. So this is probably going to be the first of many matching family ensembles. I don’t know how all those bloggers out there take beautiful pictures of their kids while showing off the beautiful clothes they have on at the same time. This is the best photo I got and it was the last of about a hundred, and really it’s not that great. But you get the drift: one long sleeve shirt, one short sleeve, and one pair of leggings. all made out of this geek chic fabric I found at the thrift store a loooong while back. It is so perfectly seventies: the stripes are brown and this sort of rainbow confetti, meshy stuff (my daughter calls them her sprinkles pants). It’s a knit that has sat on the shelves waiting for me to learn how to use my serger. And guess what? I learned how to use my serger! A gracious friend taught me how while we made the 90 minute shirt together. She made the long sleeve version and I made the short sleeve, but hers was so cute I ran home and made the long sleeve one. Of course I didn’t read the directions, screwed it up and the sleeves are too long, but that drooly baby really couldn’t care less. Now my daughter wants to know where daddy and mama’s matching shirts are. Sound of music here we come! Posted March 18th, 2010 in sewing clothes. Tagged: 90 minute shirt, baby, handmade, homemade, kids, knit, serger, sewing, stash.